One of the best drives I’ve ever been on is through Glacier National Park on the Going-to-the-Sun Road. I caught it right at the end of the season so the weather was iffy the duration of my trip so while that was a bummer for sunrise/sunset shots it was great for catching the clouds above the valley (when it wasn’t raining constantly on me). We are heading home from Tennessee today. We debated going to Montana but the one thing that turned me off was the touchy weather – who knows it could have snowed in Glacier National Park this week? However, I do know there would have been a lot less people than we encountered in the Smoky Mountains. I really wanted to love it there but despite the beauty – especially in the changing fall season – I can’t fathom why anyone would enjoy the traffic/congestion/etc… that comes with the city of Gatlinburg being a bottle neck right outside of the park. The purpose of going out in nature is to get away and I just wasn’t able to do that in the Smokies so for me the trip was more stressful than my daily job. I’m not sure exactly what river this was but it was only a short hike off of the Going-to-the-Sun Road in Glacier National Park. The time of year that I went (September 2013) there was a lot of bear activity so seeing that I was a solo hiker I was wary of getting too far off by myself in case I stumbled across a hungry grizzly or something like that. It was a rainy day and as I always do on days like that I look for places with water where I can try and capture the motion of it given the overcast skies. All you need is a tripod, a delayed shutter click and let the camera do its work. This year we decided to take an October trip out to the Smoky Mountains in October to catch the changing of the seasons. Between my wife working nights at the hospital and all the moving, packing/unpacking we’ve been doing we haven’t had a chance to be together too much so it will be a nice trip for the both of us and we are really looking forward to it (even though the cold, harsh Chicago winter will come shortly after that). The largest and deep lake in Glacier National Park – Lake McDonald – stretches nearly ten miles and is one of the most accessible lakes in the park. I was lucky enough to visit Glacier National Park in 2013 on my way to a work trip up in Calgary. This was my last day in the park and I visited this lake on my way out to the airport. For most of the morning it didn’t look like there was going to be much of a sunrise but then all of a sudden the clouds lit up in a wide array of purple and pink colors. The colors were very brief – maybe two minutes before it went back to being solid grey – so I was fortunate to get a few shots in before I headed out. Going through some of these pictures over the weekend makes me really miss Montana – hopefully we will be able to take a trip out there soon. Located in the Many Glacier Region of Glacier National Park is Swiftcurrent Lake which is dominated by Mount Grinnell directly across the most easily accessible shore. A favorite place for sunrise amongst photographers it is often packed. Their is a lodge nearby which in the summer months is open early for coffee which is a welcome treat when you are standing on the shoreline awaiting those first rays of sun. The sunrise disappointed in the morning but I popped my ten-stop ND filter on and took some longer exposure shots to get the motion of the big, puffy and fast moving clouds in the sky. This was a twenty second exposure which captured the movement in the sky but smoothed the waves in the lake making it seem incredibly smooth. 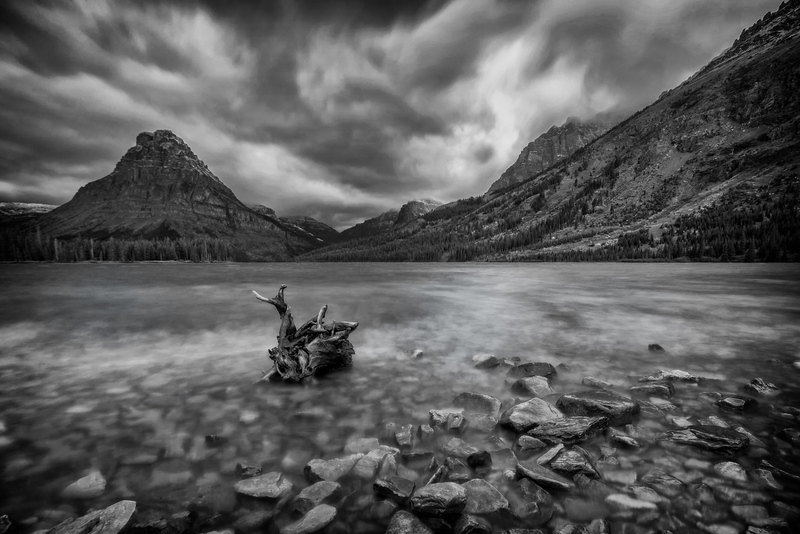 Wild Goose Island is located in the middle of St. Mary’s Lake in Glacier National Park. The lake is just off of the historic ‘Going-to-the-Sun’ road which is the main artery of one of America’s best national parks. The drive through the park on this single road is nothing short of epic – each twist and turn presents a different stunning view. I was here in September 2013 and while the weather didn’t completely cooperate it was still a trip that I’ll never forget. For this particular photo I shot Wild Goose Island with a 10-stop ND filter which allows for less light to pass through to the camera’s sensor. As a result, you are able to leave the shutter open and capture movement in the sky and also smooth the waves of the lake. In Glacier National Park one of the best places to catch the sunrise is at Swiftcurrent Lake as many photographers like to capture the unmistakeable Grinnell Point with the alpenglow on it. Unfortunately for me the clouds interrupted my sunrise and the colors weren’t as dramatic as I hoped. However, the pre-dawn light was nice and I think the poor weather conditions kept alot of the other photographers away because I was here almost by myself which is amazingly rare with an almost always full hotel right on the edge of the lake (Many Glacier Hotel). My posting has been a little sporadic lately but I’m hoping to get a more scheduled approach going as my personal life settles down. This has been one of the most difficult year’s of my life and I will be really pleased when the clock turns to 2015 and I can put it all behind me.